If there was a book I wished had existed when I first became involved in Bitcoin in 2013, The Age of Cryptocurrency would be the one. So, to all my friends who are still skeptical about cryptocurrency, or want to better understand it, this book was written for you. It will save you hours of piece-meal catch-up reading about this topic from a variety of sources or blogs. The authors, Paul Vigna and Michael Casey are accomplished reporters and writers for the Wall Street Journal’s Money Beat [Michael’s bio, Paul’s WSJ page]. No doubt, the book is extremely well written, and easy to understand. In a nutshell, it narrates the chronology of Bitcoin’s evolution with impeccable precision. It is free of hype, while not being shy in pinning the important role that cryptocurrencies will play in our future. In eleven chapters, the book cleverly combines extraordinary stories about Bitcoin’s usage around the world, while weaving more serious explanations of the key concepts behind the cryptocurrency revolution and all the pieces that relate to it. The book starts with a sweeping account of the origins and relationships between money and governments from the Babylonian times, to the Chinese emperors, into Europe’s medieval rulers, to Bretton Woods, and the watershed moment when Nixon un-pegged the US dollar from gold, and beyond. That part puts an insightful context about the global evolution of money in our society and economy. The book’s second chapter, rightfully called “genesis”, is framed by a key statement that Satoshi Nakamoto once made: “What is needed is an electronic payment system based on cryptographic proof instead of trust.” Hence, you’ll understand the omnipresent importance of the “trust” theme that dominates today’s bitcoin applications. The “genesis block” in cryptocurrency speak marks the launch of a cryptocurrency’s blockchain, its most critical beginnings. I loved how they recount the story of Satoshi Nakamoto, by unravelling it with a suspense-like cadence. If you are patient enough to understand this chapter, you will understand all of the basic foundations of cryptocurrency and what it has sparked. And with great attention to detail, the authors proceed to add the important pieces of context related to the evolution of digital currencies / e-cash in the days following the mid 90’s Internet revolution, to the birth of the bitcoin “community” of early actors and players that gave it wings, sails and wind. My favorite chapter is the one titled “Building the Blockchain”, because understanding the blockchain is so essential to understanding the genius behind cryptocurrencies. In it, you will find a smart diagram that clearly explains how the blockchain works. You can’t skip that understanding if you want to get self-motivated about Bitcoin’s future. “The blockchain, the all-important ledger that functions as bitcoins central nervous system, was Nakamoto’s signature achievement. While technical in nature, it reflected important insights about the psychology of money and community, and what’s needed to create rules that make individuals act in the interest of the group.” There are two subtle, but key concepts to remember: psychology of money, and collective impact of user actions. Then, there’s another chapter covering the “2.0” movement, which depicts the realm of more advanced applications of the blockchain, although I felt that that part barely scratched the surface of possibilities. Other chapters are devoted to understand Mining, how Bitcoin moved away from its original “crypto-anarchists” supporters, how Bitcoin will help the Unbanked of the world, and insights into how the Bitcoin “core developers” are doing their innovative work to continue evolving its capabilities. I had been looking to find a book on cryptocurrency that wasn’t too basic, nor technical, and I was pleased to find it. The Age of Cryptocurrency:How Bitcoin and Digital Money Are Challenging the Global Economic Order covers all the ground you need, how it all works, the key players, issues, and Bitcoin’s future. 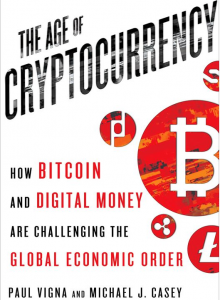 If you are part of the 99% who hasn’t fully grasped the meaning, importance and implications of Bitcoin and cryptocurrencies, this is definitely the first book you ought to lay your eyes on.